These PET cosmo round bottles in various colors come with black ribbed PE lined caps. 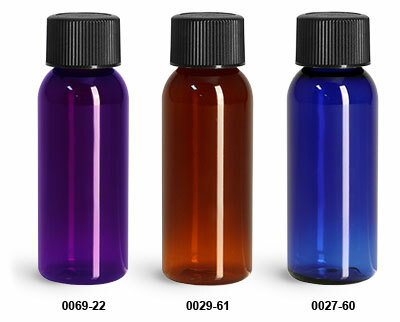 These small plastic bottles are a great option for packaging amenity products. The black polypropylene caps PE liner is a general-purpose liner. It offers good chemical resistance, making it a good choice for acids, alkalis, solvents, alcohols oils household cosmetics and aqueous products.